South Korea’s largest automakers Hyundai Motor Co. and its affiliate Kia Motors Corp. have expressed optimism for the coming year, with both saying that they plan to expand production and increase sales. The companies forecast that sales for the fiscal year would be 4.7 percent higher than the previous year. Hyundai and Kia combined forms the world’s fifth-largest automaking group. According to regulatory filings, Hyundai and Kia plan to deliver a combined 8.25 million vehicles in 2017, up from 7.88 million units a year earlier. Hyundai expects to deliver 5.08 million vehicles, while Kia expects to deliver 3.17 million vehicles. Wall Street analysts are predicting the delivery of 8.24 million units, on average. Hyundai and Kia are counting on new model introductions to counter rising competition in the industry. The automakers plan to introduce more than 10 new vehicles or revamped versions of existing models annually. Hyundai will introduce its midsize luxury sedan, the Genesis G70, this year as well as introduce a small SUV in South Korea. Kia will unveil Morning compact car, a premium sports sedan, and a China-specific SUV. New plants in China and Mexico will help the companies raise output. Hyundai’s factory in Cangzhou, Hebei province will have an output of 200,000 vehicles in 2017, with plans to expand that to 300,000 units by 2018. Its fourth plant in the Asian nation is slated to begin production of its new small sedan, the Verna Yuena. The company’s fifth plant, in Chongqing, will be completed this year. For the first time since 2000, both posted a decline in deliveries in 2016. Hyundai-Kia jointly sold a little over 7 million units from January to November in 2016. Hyundai’s sales at home fell 7.8 percent and deliveries overseas declined 1.2 percent last year. This was the second consecutive year that the automakers missed their sales targets. Hyundai counts China as its biggest market by volume. Deliveries of the two South Korean automakers in China rose 7.2 percent in the 11 months through November. Hyundai hasn’t released its delivery figures in China for December. Sales in its second-largest market, the U.S., rose about 2 percent in the 11 months through November. However, that was lower than the 5.6 percent growth in the same period a year ago. Hyundai’s sedan-heavy lineup hasn’t been as popular with American consumers during this period of relatively low gasoline prices. 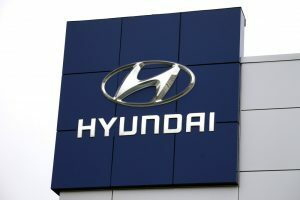 Last month, Hyundai announced that its chief executive officer for America, Dave Zuchowski, will be leaving the company.